complete with all 14 test sheets for you to work from as you develop your skills. Coaches will sign off units as you become competent. Each time you complete a test you will be awarded a certificate. Folders ordered on line will be available for collection from reception. Select from one of the following options, add a name and address, or put "to be collected". 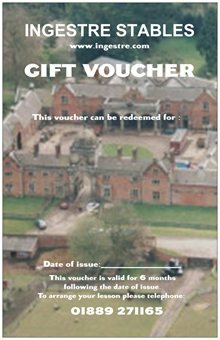 If you would like the voucher posted straight to someone else put in their name and address. If you want a message to go with the voucher add it to the message box. If you want the voucher posting don't forget to add postage at the bottom of the page. Alternatively, ring the office on 01889 271165 to arrange.